On this page, you will find an overview of the main menu functions, and short step-by-step tutorials on how to create and manage your experiments and tasks. Here you find a chart-overview to monitor results from your running experiments and tasks. In this section, you can create experiments and different tasks. The platform provides a range of different tasks which you can select to use in one experiment (an experiment can consist of multiple tasks. We speak of experiments on this platform, but of course you can call this a study if you collect data by observing people doing their tasks. Here you can download the results of your experiments, either as a batch download of all your studies, per experiment, or per individual task. Furthermore, you can find the number of participants per experiment in this section. The platform offers an annotation function for keeping log files of your experiments or to make notes (or other experiment guidelines). On this page, you will find an overview of the people you invited to view your experiments and share your data. Here you find example sample images in the correct dimensions for best cross-platform performance (pc, tablets or cellphones). You also find common (priming) stimuli you can use, for example a fixation cross. This page, where you find an overview of the main menu functions, and short step-by-step tutorials on how to create and manage your experiments and tasks. How do I create and manage experiments, tasks and questions (or other actions)? You have to create an experiment first, before you can add tasks with individual questions and actions. See an experiment as the toolbox, the tasks are the data gather tools in that box. Every task consists out of one or more specific actions (like looking at stimuli, making choices, answering questions, etc.). 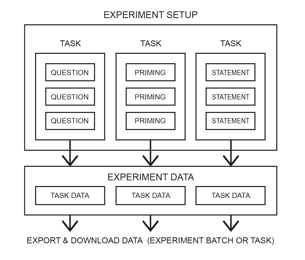 In the image you see a setup of an experiment consisting of various tasks. Each task contains one or more actions. You can use imagery in every task/question/action. All response (reaction) times are measured in milliseconds. Note: In the interface we use Tasks for all type of tasks, and Questions for all type of actions within a task. Per experiment a unique url code and QR-code is generated, which you can use in your communications. Now, conduct your study on every mobile phone, tablet or PC, on any location. WorldBrainWave works in all browsers on any mobile, tablet or desktop (no app install). You can (pre)view your research results (only 'click' data) in your dashboard in Chart Results, which you can find in the main menu. After you have finished your study, survey or experiment(s), you can download your data in .csv format in the Results / Downloads section, which you can find in the main menu. You can download a complete batch of the experiment or download clean data per task. TIP: Please complete your profile page first. This helps (if needed) fellow researchers to find you by your research projects on the platform. 1 min setup if experiment information (Informed Consent, Study Information, Briefing and Debriefing) is already available. Note: The Title, Informed Consent, Study Information, Briefing and Debriefing can be updated or edited or deleted at any time by selecting 'Edit' or 'Delete' on the experiments screen. Below you see an overview of the Experiment bar with the tool options. Every experiment offers a set of more advanced Options. These can be accessed by selecting the white Options button in the Experiment tool option bar. Ask location – This option lets you view the location where users login to participate. Participants will see beforehand a consent pop-up on their browser, asking to share their location data. Accepting or refusing will not influence the study or data collection. 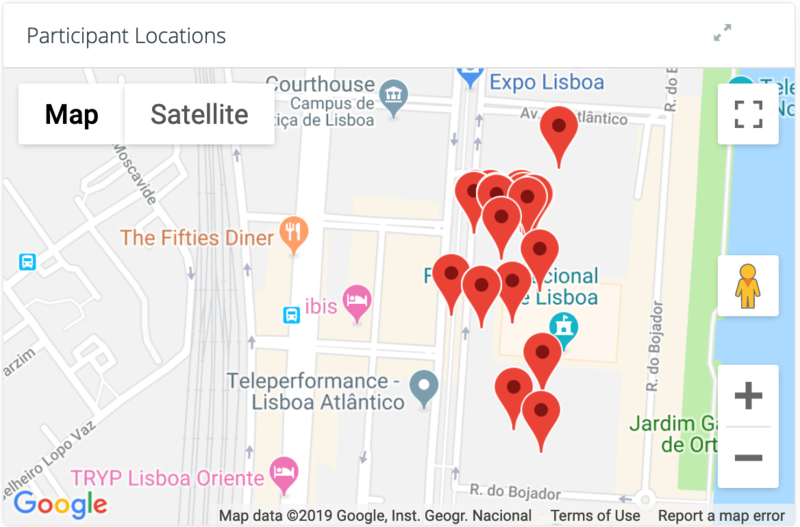 You can monitor the location of data collection in Chart Results. Active informed consent – Ethical guidelines for academic studies require an active informed consent. Selecting this options disallows participants to continue to the experiment without having read the study information and informed consent. Furthermore, it creates an option to refuse participation, thus sending participants towards the end of the experiment. External URL – You can automatically send participants towards an external URL once they completed the experiment. This will be called as soon as the debriefing appears, so make sure to include the debriefing or final notes as instructions into the experiment if you choose to use this option. SONA connection – Worldbrainwave offers the option to have SONA automatically grant credits to your participants, if they completed your experiment through SONA. To do so, make sure to add the correct URL both on the side of WBW as well as on the side of SONA. You do not need to add any type of survey code or token, just paste the URL into the correct box and make sure your URL ends with ‘=’. Note: When selecting Personal Experiments and Active Experiments only your own active experiments are shown. Experiments are shown in order of last creation data or update (shown on top). Select 'Show question in sequential order' if you want to show questions alwys in same (strict) order. Select 'Fix response position' if you want to show two images always on the same left/right position. Note: You will see the tasks in the Task bar. Each bar consists out of an unique ID number, Title and task subscription (as a helpful reminder). The Title, Type of task and Instructions can be updated, edited or deleted at any time by selecting 'Edit' or 'Delete' in the Task bar on the Tasks screen. Below you see an overview of the Task bar with the tool options. Note: You can simply change the order of Tasks by dragging and dropping the Tasks to re-arrange them. You can remove a task from an experiment (but keep it for later use) or delete the task completely (including all its contents). Note: When you only remove a task, the task (including its contents) stays in your account for other experiments. You can find the removed task in the pulldown 'Add Existing Task' menu on the Tasks page. A removed Task will stay visible in the 'Add Existing task' menu, so you can reuse the task). Select Delete (red button) on the right of the Task you want to delete. Note: Be aware, when a Task is deleted, you delete all the questions, actions and stimuli imagery it contains as well!). It is strongly adviced to export questions (including its imagery) as a backup before deleting a Task (see Export Questions). In this way you can recover your work, should you change your mind in the future. A deleted task will disappear from the 'Add Existing Task' menu. 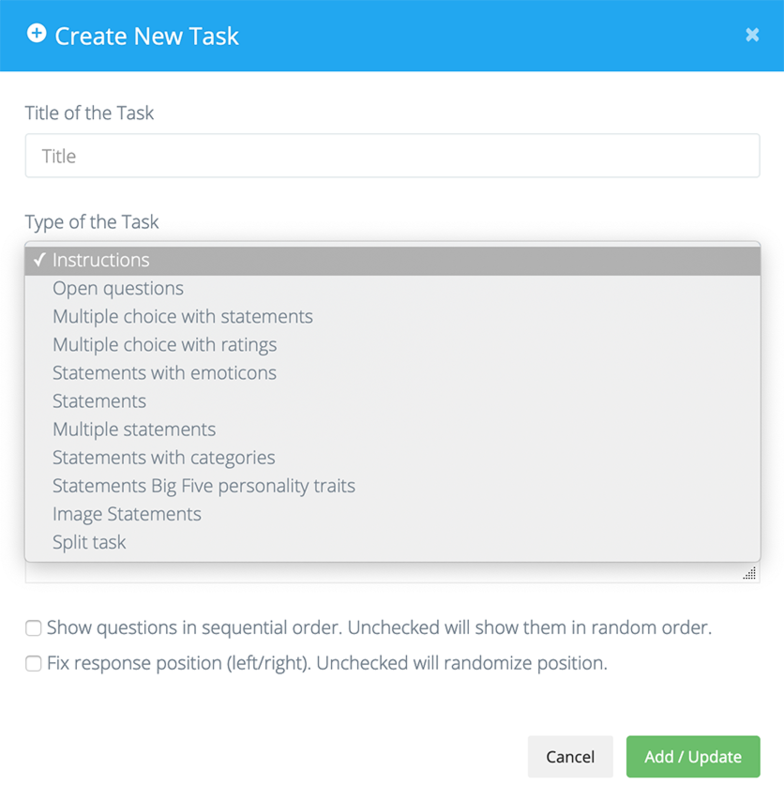 Currently, there are 10 different tasks with stimuli options available in WorldBrainWave. Select a Task to read the step-by-step tutorials. Instructions - Use this task to display instructions or any other type of information to your participants. It can be used anywhere within the experiment and does not require a response. Please note that every other type of task automatically contains an instructions option. Tip: You can use Instructions as well for additional/obligatory reading information (like informed/legal consent) at the start af your study. Or use it for addtional debrief information at the end of a study. The Informed consent and Study information screens are already offered in the Experiment section, and shown as page links at the 'Agree' page. Open Questions - Use this task to provide text input answers. Participants will see a textbox in which they can respond. Response is not mandatory so participants can choose to leave a field empty. After completing your study, you can find all open answers from participants in the Results / Downloads section. Multiple Choice with statements - This task displays a multiple choice question, which also can be used for likert scales. You can choose any answer option or statement you want, with a maximum of 9 options. Participants must and can select only one option. Note: As this is 'click' data, you can (pre)view your results in the Chart Results section. After completing your study, you can download your data in the Results / Downloads section. Multiple Choice with ratings - This task displays a multiple choice question with five answer options (or likert scales), ranging from 'Strongly Disagree' to 'Strongly Agree. If you want to use other answer options, please select Multiple Choice with statements where you can choose any answer, statement or likert scale you want. Statements - This task presents one or two statements to the participant, from which a choice has to be made. An answer is collected when one of the statements has been pressed on the screen. Statements with categories - This task presents one or two statements two the participant, from which a choice has to be made. Furthermore, the statements are categorised but the categories are not displayed to the participant. An answer is collected when one of the statements has been pressed on the screen. Image Statements - Use this task to present one or two pictures to which the participants has to respond or make a selection. Statements with Big Five personality traits - Use this task to present a variation of the Big Five personality test (which takes only 4 minutes). A version with statements (words) is ready-made within the platform (you cannot not alter the words). Here, you can add your own statements and group them according to the Big Five personality traits. Primes / Stimuli - With every question or action you can show an image, and before almost every question or action you can show one or more priming words and images (and adjust showtime of every prime in milliseconds). Select Create prime (blue button). Repeat this with multiple primes. Important: You cannot (in this BETA version) change the order of the primes, so upload your files in the right order! Split task - With this module, which is not a task by itself, you can branch the experiment into two seperate versions to guide the flow of the experiment. By using a split task, you can have two conditions (with two different tasks) within one experiment (and you only need one QR-code or URL+code to invite participants). The Split task divides the participant pool randomly into two equal groups (50%/50% with a small deviation due to randomness). Before you start implementing a split task, it is adviced to create a second 'sandbox' experiment to view and edit the two tasks you want to split. After thoroughly testing you can add the split task into the experiment where you want to have the two conditions. (you only add the Split task, not the tasks you split, you can find and edit these tasks in the 'sandbox'). You only need the task ID, in this example 382 and 383. WorldBrainWave offers high accuracy and stimuli precision on location or in lab settings. varying from 8-20 ms (fastest models) to 200-300 ms (older and slower models). Note: It is adviced to use a minimum of 200-300 ms showtime when you use rapidly changing priming images on smartphones on location. In this way you also cover older/slower mobile phone types. For PC/laptop: The refresh rate of an avarage PC-monitor is around 16.6 ms.
By altering the amount of ms of short priming images, you can test your setup. In the Resources section (in the left main menu) you can download sample images in the right sizes that will help you to create stimuli artwork in the correct dimensions for best cross-platform performance (PC or smartphone screens). You also find common (priming) stimuli free to use. IMPORTANT: Don't upload hi-res files! Upload only stimuli in the correct pixel/dpi size (see dimensions below for best results). In the current version (v1.1.7), you have to upload imagery in the size(s) that you want to use (in next version, imagery will be automatically scaled). This is the optimal image size to use for priming purposes (shown before questions, no other items in the screen). Please use this image size in combination with questions or other button options. But as this is shown on laptop screens, you could use format sizes to your own discretion. But as this is shown on PC/laptop screens, you could use format sizes to your own discretion. After you have finished your study, survey or experiment(s), you can download your data in .csv format in the Results / Downloads section. For example, after completing a survey with open questions, you can find here all the answers from your participants. or is readable in statistical software like Excel, SPSS, r, python or Matlab. Batch download all data from all experiments as a .csv file. Batch download per experiment (including all tasks in that particular experiment) as a .csv file. Download data per task a .csv file.